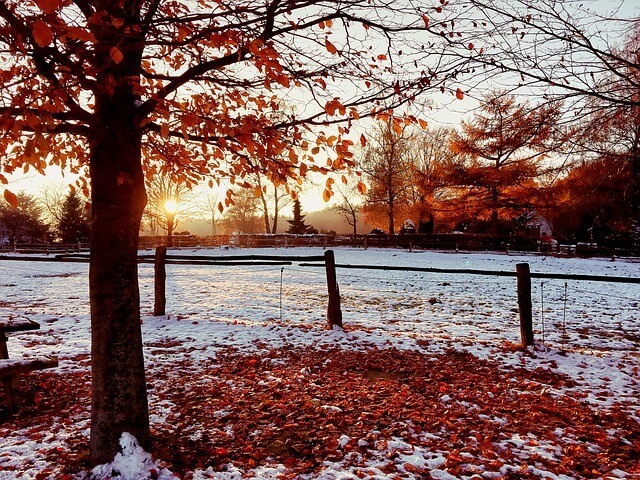 As summertime heat gives way to crisp autumn air, it’s only a matter of time until temperatures dip below freezing and rooftops and yards are covered in glistening white snow. Although it may seem premature, now is the perfect time to make a list of what needs to be done around your property to prepare for winter. Many of us don’t think of possible water damage during the winter months, as we associate that more with flooding from spring and summer rains. However frozen pipes, snow on your roof, and ice trapped in gutters are all sources of potential water damage in and around your home. If left unattended not only can restoration be costly, but mold allowed to flourish in spaces we can’t see can affect your health. Inspect and clear gutters and downspouts of all debris so water from the snow melting off of your roof does not get trapped there and refreeze causing an ice dam. As the ice melts water can leak through the roof and seep into your attic or crawl space and eventually damage the ceiling of your house as well. Also, if gutters are clogged, water can drip and pool on the ground next to your home’s foundation causing potential damage. Prevent frozen water pipes that can crack under pressure and flood when the ice inside melts. Insulate pipes in attics, outside walls, or crawl spaces and keep cabinet doors open underneath sinks so warm air from your house can circulate around the pipes. Also, if temperatures dip very low and you plan to be out for a while, leave faucets on a slow drip. You can also invest in a detection system that will monitor water pressure and signal a water shut-off if you have a leak or blocked pipes. Shut off water to outdoor sources like hoses and spigots. Disconnect hoses to prevent water from freezing in the line creating a blockage that can cause a backflow leading to a leak inside your home. Also, drain the water from hoses and store them away for the winter so they don’t freeze and crack. Watch for snow and ice build-up and check for leaks regularly especially around vulnerable areas such as basement or ground-level windows and doors. Take time to clear snow away from these areas as they are susceptible to water leaks. Check your basement regularly to make sure the walls, windows, and doors are properly sealed. Also, inspect water pipes along outside walls for cracks and drips. Turn off the water supply if you’re going to be out of town for an extended period. Now is also an ideal time to repair your roof, and fix or replace gutters, downspouts, and pipes before the damage becomes even more costly than repairs. If you notice or suspect any water in your home, act immediately. As the Bitterroot Valley’s premier water damage restoration service provider, the team at Purity Cleaning and Restoration is on-call 24/7. By using state-of-the-art moisture detection equipment to locate and eliminate hidden moisture, our trained and experienced technicians are experts at handling all phases of the water damage mitigation process. Call us at 406-642-3545 any time day or night for emergency service. An immediate response and the fastest drying possible are key to successful water damage restoration.